Reproduced with permission from the Caboose Cable newsletter. Over the past 6 months to a year, there’s a question I’ve had a difficult time avoiding, “When is the 757 coming home?”. Most of the time I had to come up with a vague answer, and that never satisfies a curious mind. The truth is I really didn’t know myself for the longest time. Lucky for you, I can tell you now, February 14, 2019 at about 3:30PM, I’m guessing you’ve probably heard the news by now so it’s not much of a surprise. 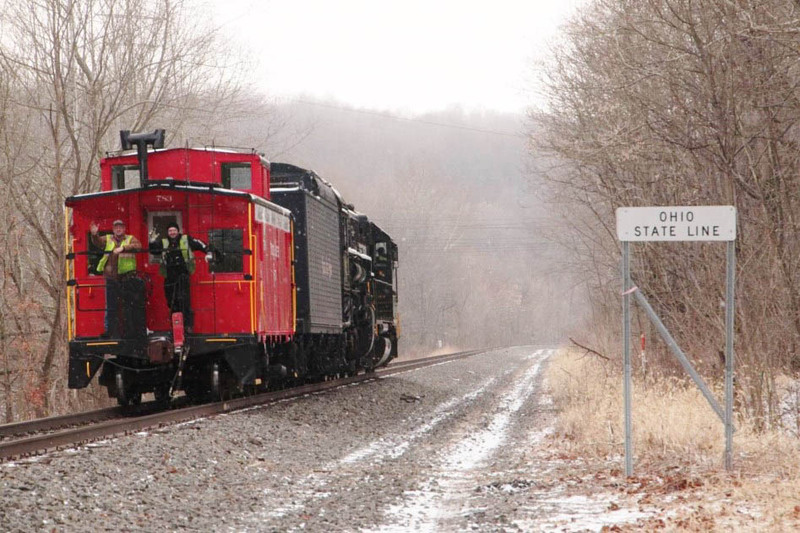 It wasn’t until our caboose arrived in Strasburg that we had a target date to begin the move with Norfolk Southern, February 11th. We had about two weeks’ notice when word came down. Of course, the date was set by Norfolk Southern, but arrangements had to be made with multiple parties to make this work. 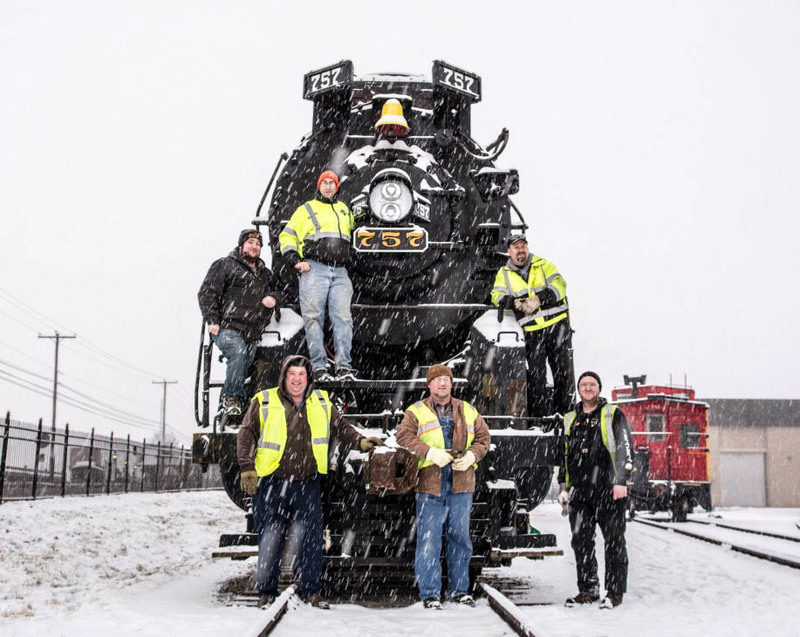 Norfolk Southern, Amtrak, the Railroad Museum of Pennsylvania (RRMPA), the Strasburg Rail Road, our contractors Dan Pluta & Zach Hall, and ourselves had to get in sync with one another in that short time frame. Any hiccup along the way with just one of those involved and we’d have to reschedule, thankfully it all worked out. Last minute details started popping up the week of February 4th. I’m not sure we could have survived this without email and cell phones. Everyday someone needed a new piece of paperwork, or a signature here, or some mechanical data there. One item that popped up just days before the move was that Amtrak no longer had our clearance information on the locomotive. This was a clearance file that was approved in 2017 before we even considered such an idea. With the length of time that had passed, and different people involved, we had to resubmit everything for review again. Thankfully Amtrak realized this was time sensitive and fast tracked the approval. Professionals in the business would probably tell you this is nothing out of the ordinary when executing an unordinary move such as this. The constant barrage of emails and phone calls right up until showtime should be expected. It was a trying week, but the reward was worth every bit of it. On Friday, February 8th, I worked my regular job on the hump at Moorman yard. After my shifted ended around 4PM, Chris Beamer met me, and we headed for Strasburg. It’s about a 7-hour drive, so we’d be getting in late. Out of that 7 hours, most was spent on the phone, arrangements and details were still being made and/or changed. We arrived at the hotel about 11PM, the bed felt really good, but the circumstances made it difficult to sleep. As it would turn out, sleep would be a luxury we wouldn’t have much of during the next 6 days. The morning of Saturday, February 9th dawned as a beautiful sunny day, beautiful right up until we went outside. Temperatures were in the high 20s/low 30s, but the wind was blowing about 25 to 30mph. Chris & I headed over to the Railroad Museum of Pennsylvania first thing in the morning and meet with Curator Al Martin and Director Pat Morrison. We presented them with a $5,000 donation from the MR&NKP general fund, a month earlier the MR&NKP BOD approved this donation in response to the generosity and cooperation we’ve received from the RRMPA during the BRING BACK 757 effort. They also had a gift for us, the 50-year-old file on the locomotive. This file would contribute to the lack of sleep the next few days as the material enclosed was fascinating reading. After some visiting with Al & Pat, we headed outside to prepare the caboose and the locomotive for the trip. All the heavy work had already been done, but we had a few small jobs to tend to. Dan Pluta would arrive in the afternoon about 1PM. 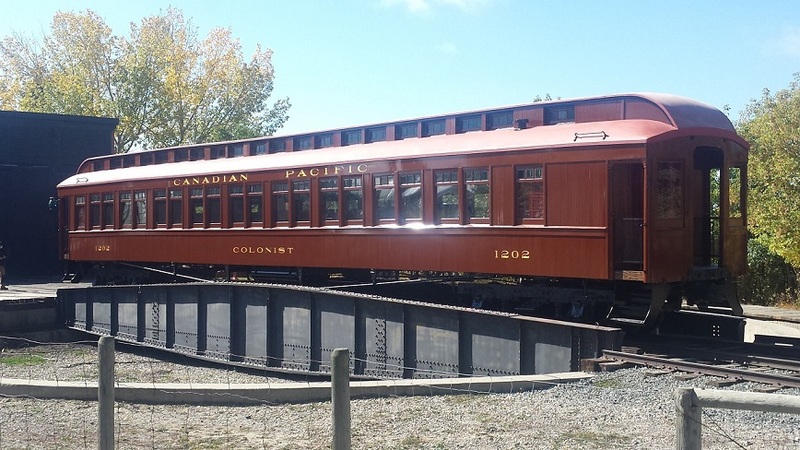 With his help we replaced the defective gangway plate between the locomotive and tender, mounted hoses on the locomotive for the alemite grease gun, mounted a brake cylinder pressure gauge, lubricated the locomotive, and loaded tools and sup-plies in the caboose. 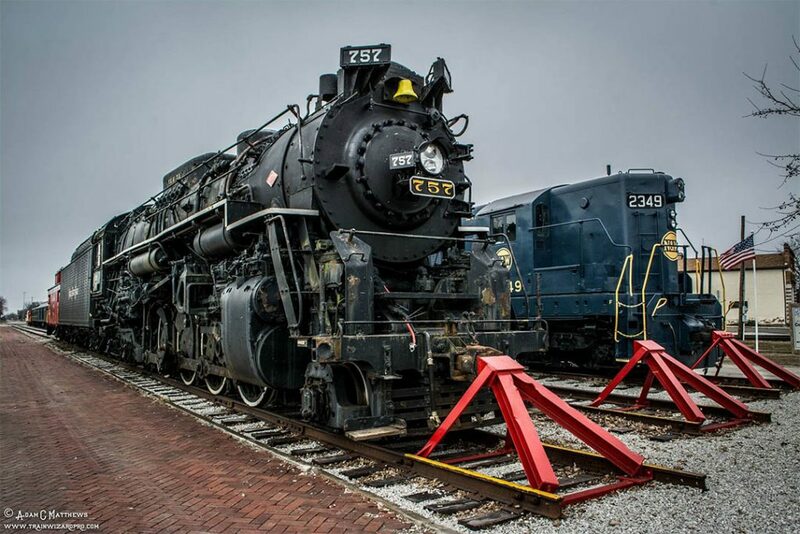 During this time, the Strasburg Rail Road approached the track leading to the museum. This turned out to be a source of entertainment for us. The railroad was clearing out some freight cars so that they could access the museum Monday morning to get the 757. There were many railfans in the area at the time. I think the fact that we were working on the locomotive, and the railroad was working in our area created a “premature foam wave” as they thought this was the big moment. There was 10 to 15 cameras pointed at us anticipating something big to happen, disappointment would soon follow as today was not the day. The RRMPA requested NKP 763 from the N&W, the 757 was a consolation prize as the 763 had just been promised to the Virginia Museum of Transportation. We determined the route 757 took east. It left Bellevue on N&W’s Wheeling District to Pittsburgh, from there it was given the Pennsylvania Railroad for the remainder of the trip. Sunday, February 10th would be a low-key day. We could not perform any work on the locomotive as the restoration shop at the museum is closed. We were able to do some grocery shopping and supply the caboose for the trip. Zach Hall joined our party in the afternoon. The highlight of the day would be a dinner meeting with Kurt Bell that evening. Kurt has worked for the RRMPA and the Strasburg Rail Road in the past and is currently working at the Pennsylvania state archives in Harrisburg. He is a walking encyclopedia regarding the RRMPA. In the past 18 months I’ve received many archival items from Kurt dealing with the 757, it was a pleasure to finally meet him. Monday morning (February 11th) arrived fast after a night of little sleep. This would be the big day, the one we’d been looking forward to for so long. A heavy snow had settled in overnight, this would be our environment for the next few days. Rick Rowlands and Nick Hovey had showed up, they would be very helpful documenting the move. With the hard work both had contributed to the project, I was happy we could all be there and share the moment together. We arrived at the museum around 7AM. The first order of business was to get the stove lit in the caboose. Pat Morrison showed up and Chris signed the title of the 757 at the conductor’s desk of the caboose. Then the Strasburg Rail Road arrived to pick us up at 7:20AM. After a job briefing by all involved, doubling the caboose to the locomotive, and an air test of the train, we left the RRMPA for the last time. Zach and Dan would be riding the caboose, Chris drove his own truck, and I would be driving Dan’s truck. This was an exciting moment but also a bit bittersweet at the same time. We’d been working here and making friends for the last 18 months, I’ll always look back on that fondly. In one final bit of irony, as the train cleared SR741 in front of the museum I looked at the clock in Dan’s truck, 7:57 AM. Group Photo just before leaving the Railroad Museum of Pennsylvania. Left to right, Nick Hovey, Chris Beamer, Rick Rowlands, Dan Pluta, Dwayne Fuehring, Zach Hall. Photo by Chris Pollock. Word was out and the railfans were starting to find us along the way. As we went by the Red Caboose Motel & Restaurant, the owner took a video of the train passing and posted it to Facebook. To date, that video has over 72,000 views, it spread like wildfire. It took us about 20 mins to reach the end of the railroad that interchanges with NS on Amtrak’s Keystone Corridor. It was there that I met Bruce Kerr. Bruce is an NS employee that works out of Enola as an engineer. Today however, he’d serve as a corporate photographer. I wasn’t expecting the move to be covered by the railroad’s PR department considering I had been sworn to secrecy regarding movement details, but in the end, NS would embrace the move posting pictures and video on their corporate Facebook page. A NS local crew arrived just after 10AM, it started to sink in that this was really going to happen. After a job briefing, coupling up, and an air test, we were off. Watching the train maneuver over high banked 120mph curves at a crawling speed of 25 mph was a bit unnerving. Zach and Dan seemed to taunt us by waving from the low side of the caboose while we motioned for them to run to the high side. It looked as if the whole train might tip over if it stopped moving, thankfully it was more optical illusion than reality. We left Amtrak’s Keystone Corridor at Lancaster PA and made a short stop to check bearing temperatures, all was well as it would be the rest of the trip. This crew and power would take us as far as Enola, PA, we arrived about 3PM. With the first 60 miles behind us, the locomotive towed backwards without any mechanical issues, that had us feeling confident about the rest of the trip. We wanted to wye (turn) the locomotive before continuing west, but that would have to be done by another crew. With no outbound road power or crew in the near future, we would leave the train in Enola for the night. We serviced the locomotive and around 5PM left for dinner and a night of rest. Have you ever looked back at the end of the day and thought, “man I can’t believe that just happened”? Towards the end of the day on Tuesday February 12th, I certainly felt that way. The morning didn’t start off very promising though. About 3AM I called the Harrisburg Division Chief Dispatcher, he informed me that a signal outage on the Pittsburgh Line had traffic backed up all over the railroad. We didn’t have a chance to get a crew on his watch, I was told, “check back after 7AM”. I waited till about 9AM, called again, same story, this time I was told, “check back after 3PM”. So, in the meantime I decided to call the Enola diesel pit and check on the status of our outbound power. I was greeted by a very friendly gentleman on the other end of the line named Josh. He informed me that he did have a locomotive assigned for our train. “We have the 5355 ready to go for your train, now what’s this I heard about the steam locomotive needing to be turned”, Josh asked. “Yes”, I replied. “You know we have a turntable here, I think we can turn the steam engine and put the train together right here on the pit. How soon can you guys get back here?”, Josh continued. “Our crew will be there at 10:30AM”, I said trying to contain my excitement and remain professional. This would be huge and an enormous highlight of the trip. There are very few operating turntables today compared to the steam era. Turntables and steam locomotives were machines meant for one another. There are some things in life I just don’t care to look at. Abused dogs, men in lingerie, and diesels on turntables to name a few (I’ll make an exception for covered wagons), but a steam locomotive and a turntable is like peanut butter and jelly. We arrived back at the locomotive in a very wet and slushy snow, the weather was a bit miserable, but no one was really paying attention to that. We met with the pit movers and hammered out the plan. 757 taking a spin on the Enola turntable. Photo by Rick Rowlands. Just as the crew was getting ready to position the 757 on the table, Josh came over the radio, “Don’t put that locomotive on the table!”. For a brief moment I had a deep feeling of disappointment as I thought we had been overruled by higher authority. “There’s a guy from corporate on his way to photograph this, there hasn’t been a steam locomotive on that table since 1957.”, Josh continued. Okay, my heart attack subsided. So, we waited about 15 minutes while Bruce Kerr drove 90mph through the slushy streets of Harrisburg to get the shot. When Bruce arrived, the turning began. Josh and about 6 others came out of the shop building to watch this old-time ritual occur. Everyone around the table had either a camera or a cell phone pointed at the action and nobody said a word during the entire procedure. Even though Bruce told me that NS had no intentions of posting about the move until the 757 was safely in Bellevue, they caved. A video of the turn was on the NS Facebook page about 30 minutes later. After the excitement of taking the 757 for a “spin”, the train and outbound power were put together on the outbound diesel track. Josh was nice enough to blue flag and lock us in the track so we could camp out on the caboose until a crew would be called. We (Dan, Zach, Rick, Nick, Chris, and I) spent the afternoon drinking coffee off the caboose stove, cutting up, and telling stories. Finally, we got word that a crew would be on duty at 6:05PM to take us to Altoona. Long story short, backed up traffic prevented the train from departing and by the time it left Enola Yard, it was about 10PM. Rick, Nick, Chris, and I drove through the night watching the train roll by at convenient locations. Zach and Dan had many opportunities to inspect and monitor bearing temperatures, the 757 never showed any signs of trouble. The train arrived at Altoona at 5:30AM, changed crews, and was moving again by 5:45AM. At 6:05AM, the train passed the famous Horseshoe Curve. A lone photographer was able to capture the moment and posted it online, but it was still dark this early in the morning of February 13th. Our next crew change would be in Conway, PA, just northwest of Pittsburgh. Rick and Nick had to drop out and go home, Rick was considerably sick and needed some rest. Chris and I went ahead of the move and waited in the Pittsburgh area. Things were going well, and we didn’t feel the need to shadow the move closely. We met the train in Conway around 1:30PM and the four of us serviced the 757 while waiting for the next crew. About 2:30PM, we were on the move once more. This crew would take us through Youngstown and on to Ashtabula, OH. I received a call from Nick Hovey as we were leaving, he was camped out at the state line and was going to stage a symbolic shot of the train entering its home state. About 4:30PM, that happened, and that picture is one of my favorites from the trip. At 7:50, the train arrived at Ashtabula for its final crew change. Again the 4 of us were able to service the locomotive one last time in the dark. Chris and I hadn’t had any decent sleep in over 36 hours, and most of that time we had been driving. Adrenaline was with us though, we were on the home stretch and that was all that mattered. 757 crossing over the state line. Photo by Nick Hovey. February 13, 2019, 9:05PM, that’s the exact time the 757 returned to Nickel Plate rails at NP tower in Ashtabula. The locomotive had spent 19,055 days away from home territory, the liberation was complete. We went through all the towns known in the area for their NKP roots. Madison, Perry, Painesville, Mentor, Willoughby, Wickliffe, in the dark of night she moved west towards Cleveland. We rolled into Bellevue a little after 3AM, everyone of us with a sense of pride and joy that we’d finally brought her home. Some of our membership, family, and friends watched us pull in, they had been tracking us all week. At 3:45AM, badly in need of sleep and showers, we left the 757 to spend the night behind the diesel shop. She wouldn’t be lonely long. The next morning, we met at the locomotive at 11AM. I was promised a crew at noon for the placement of the 757 in the museum. Our local supervision in Bellevue was very accommodating for this move (as had been the entire railroad), Superintendent Brian Stanley promised we could arrange things just about any way we wanted. “You’ve got an 850-credit score with me, whatever you need you got it”, he told me. So, we decided to shove the locomotive into town to simulate it leading and not following. We were also allowed to stop at the roundhouse for one last photo session. The building is in such disrepair, this opportunity will never happen again. 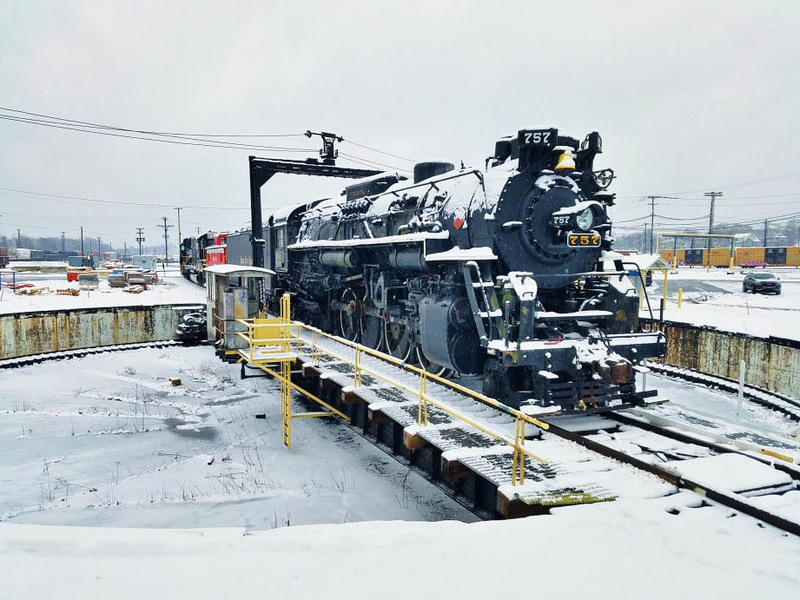 It was a solemn moment, the locomotive and the building it called home were being reunited after 52 years of separation, then immediately forced to say their last goodbyes. 757 and the Bellevue Roundhouse. Photo by Dwayne Fuehring. After the roundhouse, it was time to parade her through town. 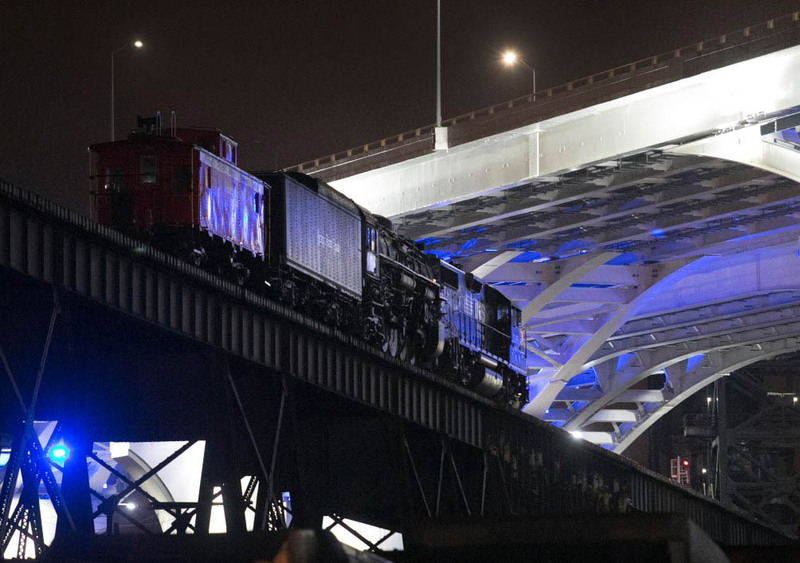 A handful of people watched her at the Kemper Rail Park, then on past Bellevue Tower, through the Mad River Connection, onto the old Wheeling and Lake Erie mainline, past the museum at Southwest St., and finally into the Coach Yard. At 3:30PM, her coupler face gently nudged the bumping post on #1 track, her journey finally complete to a cheering crowd. 757 in the Mad River Coach Yard. Photo by Adam Matthews. There’s so many we can thank for making this possible. We now have a donor board of over 400 people that has supported us in this endeavor, that’s truly inspiring and THANK YOU to everyone that’s on it. Next in line is the Railroad Museum of Pennsylvania, their approval was the very first domino to fall in our favor. 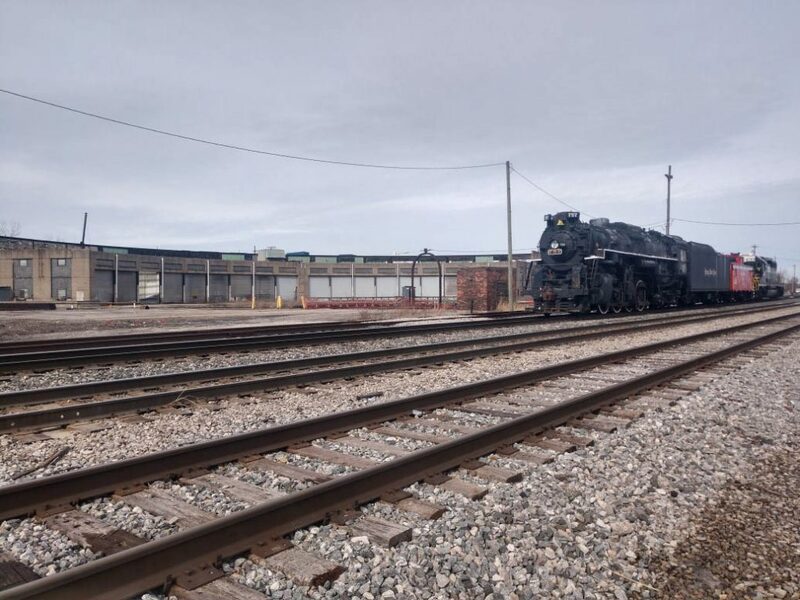 The Strasburg Rail Road, Amtrak, and Norfolk Southern all deserve our praise for making the move happen, we couldn’t have done it without them. The team (Dan Pluta, Zach Hall, Rick Rowlands, Nick Hovey, Jeff Beamer, Chris Beamer) that performed the high-quality mechanical work that enabled a safe and uneventful trip are to be commended. Lastly, I’d like to thank the Board of Directors for allowing me to pursue this dream, they gave a long leash to work from and I’m glad we could deliver a victory for our museum.